I am designing breadboard power supply and need little help. There are few different breadboard standards on the market and they all have different distances between power rails, so if I place bottom pins on PCB for one type of breadboards, power supply will not fit on others. Then I decided to simple left place for more headers to be placed on PCB with different distances between them so that power supply gets more flexibility and thus could be used on more breadboards with different dimensions. 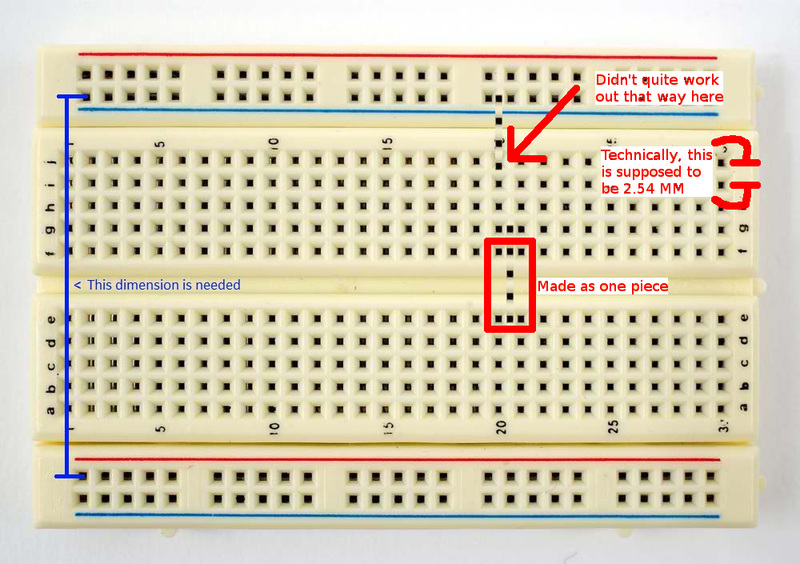 Since I have only one type of breadboard I need to get more info about other breadboards but there is no exact dimensions between power rails on the internet or datasheets so could you please fellow designers help me with this and measure distance between power rails of your breadboards? ??? Twin Industries 42.5 mm (1.67322835 in). The spacing is probably never going to be exact because the power rails and the breadboard aren't one solid piece so the gaps could be off by as much as 0.5 mm per side I imagine.